Participants are asked to think of a business idea and fill in a short online form. The best participants will be asked to submit a business plan and pitch their ideas to a panel of business experts in a "Dragons' Den" style final. The winner will receive £3500, deposited into a business bank account. PIus mentoring and support to help them bring their business ideas to life. The runner up will receive £1000 and third place will receive £200. 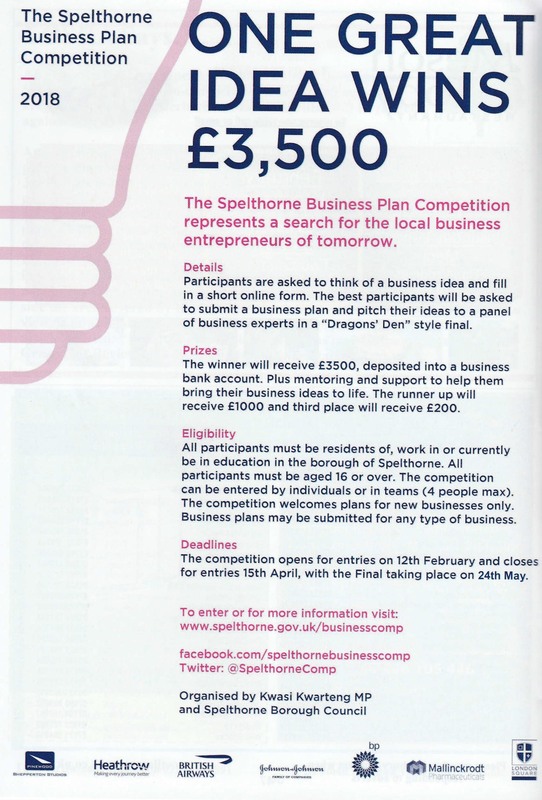 All participants must be residents of,work in or currently be in education in the borough of Spelthorne. All participants must be aged 16 or over. The competition can be entered by individuals or in teams (4 people max. The competition welcomes plans for new businesses only. Business plans may be submitted for any type of business. The competition opens for entries on 12th February and closes for entries 15th April, with the Final taking place on 24th May.